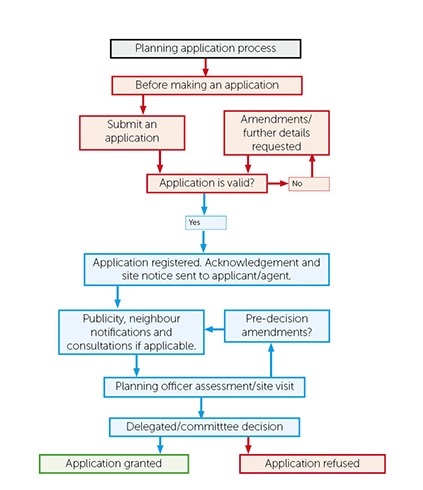 The flow chart below shows the process a planning application can go through. Not all development requires planning permission but you need to be sure before you start work. You can find out if you need planning permission by taking a look at our Do I Need Planning Permission webpage?. We provide a pre-application advice service, find out what you need to do before making a planning application. Your application will be logged when it is received by the Planning Development Support Team. The application will be checked to ensure all the necessary documentation and fee has been submitted. See tips for submitting a valid application on our submit an application webpage. We aim to complete this process in five working days. If the application is valid it will be registered and a letter and site notice sent to the applicant or agent. The letter will have your application reference number which must be quoted in all correspondence, the name and contact details of the planning case officer and the target date for a decision, which is 8 weeks for householder/minor and 13 weeks for major development, or 16 weeks in the case of an application that is accompanied by an environmental statement. Please note that should you have an agent identified on the application form all correspondence relating to the application will be sent to them as your representative. Once registered we aim to publish the application online within 24 hours. View planning applications. Your planning application - what happens next? If all of the required information is not submitted, the information is incorrect and/or the correct fee hasn’t been submitted the application will be invalid. You or your agent will be informed of this in writing. Your application will not be processed any further until the required information/fee has been received. If we do not receive a response within a reasonable timescale we will return the application and any fee and the process will have to be started again. Applications are published on the council's web site: View Planning Applications. A site notice displayed at the proposed development. Notification by letter to neighbouring properties that immediately adjoin the site. A public notice in the local press. There is a statutory period of 21 days in which people can comment on an application. However, any comments received after this date will be taken into consideration up to the point the application is determined. An application can be determined once the consultation period has expired. A comment is known as a representation and can be an objection to or comment in support of an application. Find out about commenting on a planning application. We have to consult certain bodies on different types of applications. These are called statutory consultees and include amongst others the parish and town councils, the highways, landscape and conservation departments and the Environment Agency. We may also consult other non-statutory consultees such as local amenity bodies. These consultees have 21 days in which to respond. Consultee comments on applications registered after 1 December 2015 are available to view on line: View Planning Applications. After validation the application is passed to an allocated case officer for initial review and a site visit which usually takes place within three weeks from validation. The site visit will be carried out without an appointment but if the planning case officer is unable to access the site an appointment will be made to visit the site again. Decisions are made in accordance with the Development Plan unless material consideration says otherwise. Copies of the officers report will be available online - view planning applications. The relevant Development Plan for Basingstoke and Deane is set out in the Basingstoke and Deane Borough Adopted Local Plan. If changes need to be made to the application following the site visit or in response to consultation responses or representations from the public, the case officer will negotiate with the you or your agent to make amendments to the original proposal. Proposed amendments to a planning application which significantly alter the character or description of the proposal will not normally be accepted. In these circumstances it will be necessary to submit a fresh application. Increase in application site boundary. Increase in number of dwellings proposed. Amendments that could adversely affect the amenity of neighbours. Amendments will be assessed on a case by case basis having regard to the overall size of the development and the implications of the amended plans. Minor changes to the position of buildings (or more substantial changes in relation to larger development proposals). Alterations to the proposal to meet policy or guidance requirements. Were objections or reservations raised at an earlier stage substantial and, in the view of the local authority, enough to justify further publicity? Have earlier views been addressed by the amendments now under consideration? Are the matters now under consideration likely to be of concern to parties not previously notified? Copies of the amended plans will be available to view on the council's website. If the changes are considered to be very minor we will not publicise the amendments and we will not invite further comments from the public. At the end of the assessment, the case officer will write their report. The report is then considered by either senior officers or the Development Control Committee. Most planning applications are dealt with by council officers under a Scheme of Delegation which is contained within the Borough Council's Constitution. The Constitution also sets out the circumstances under which the application will go before the Development Control Committee, and that a borough councillor can require an application to be called in to be determined by the Development Control Committee any time prior to the determination of the application. Councillors and officers are required to act within the Code of Practice which is appended to the borough council's constitution. The meeting starts at 6.30pm and is open to the public. The committee room has limited seating (maximum 70 for the public) and therefore the meetings are also webcast and available to view via the council’s website. Find out about attending a committee meeting by reading our leaflet - Can I speak about my planning application at the committee meeting? The Council’s public participation scheme allows for public speaking about a planning application if the application is to be decided by the Development Control Committee. Those in support of an application may speak if they are the applicant or where a written comment has been made on the application and where they have registered to speak prior to the meeting. Four minutes are to be shared between all in support. Objectors to the application may speak if they have made a written objection and have registered to speak prior to the meeting. Four minutes are to be shared between all objectors. Parish and Town Councils and visiting Borough Councillors also have the right to speak on applications where they have registered to speak prior to the meeting for a maximum of 4 minutes each. There will be no opportunity for any public speaker to display maps, photographs etc or to ask questions of others at the meeting. Committee members may ask speakers questions and seek clarification from officers about particular points. Those speaking against the application, those in support of the application and Parish or Town Councils will be given only one opportunity to speak on an application, regardless of whether the planning application is determined or deferred to a subsequent meeting. Comments relating to personal circumstances will not be allowed. Once the decision is made then a notice is issued to the applicant. The status of a planning application is displayed online in the application's entry along with the dates the application was received and validated. The decision notice is published online with the application's 'Documents'. To find out about a planning decision, you can view planning applications. When planning permission is granted, it is usually subject to a number of conditions. Some of these conditions can require the submission of details for approval before development begins. If development begins and the details required by conditions have not been approved the planning permission may not be valid. Details of how to submit condition details for approval can be found on the decision notice. Forms and guidance notes are available on the Planning Portal or can be downloaded from our website - submit an application/forms and fees. The target is to deal with all discharge of condition submissions within eight weeks. If you do not comply with the requirements of the conditions you could be asked to do so by our Compliance and Enforcement Team. If you do not comply we may consider pursuing more formal action which could include the serving of an enforcement notice. View our planning enforcement webpages for more information. If after getting planning permission, you want to make a small change to your application you can do this as a non material amendment, but this only applies to planning permissions and not listed building or conservation area consents. The procedure also allows the council to impose new planning conditions or remove or alter planning conditions. Any significant change would need to be dealt with by the submission of a new planning application. the proposal would result in changes to the external details that would materially alter the appearance of the building. any additional condition sought would impact on the amenity of neighbours. A submission to seek a non-material amendment must be made using the application for non-material amendment form along with relevant scaled plans and particulars to explain the proposed development. You can resubmit your application following a refusal but you are advised to address the reasons for refusal before doing so. You can seek advice before resubmission through the pre-application procedure. If the original application was validated, and your application site and proposal remain substantially the same, you can re-submit your application up to one year after it was withdrawn or determined and there will be no fee. Note : the application must be from the same applicant and you can only have one free go for the same site and proposal. If planning permission has been refused, or you have an issue with a condition that was attached to a permission you do have the right to appeal. For more information, take a look at our planning appeals webpages. If you have had your condition details approved you can start your development and in most cases you will have three years in which to start your development. Check your decision notice for the time limit that applies. Note : Obtaining planning permission does not remove the need for building regulations approval, where this is required for your development. If your development will result in new postal addresses or changes in addresses, please contact the council’s Street Naming and Numbering team once permission has been given. If you do not carry out your development in line with your planning permission you could be contacted by our Compliance and Enforcement Team and asked to bring it back in line with the permission or asked to submit a further application to cover the changes. If you do not comply we may consider pursuing more formal action which could include serving an enforcement notice.